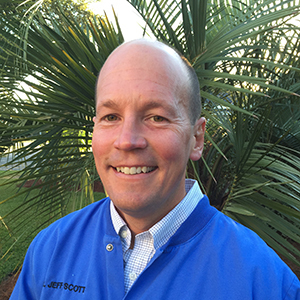 Dr. Jeffrey Scott is a native of Wilmington, NC and graduated with a Bachelor of Science in Biology from East Carolina University in 1999. Dr. Scott then earned a Master of Science in Entomology at North Carolina State University in 2001 before attending the University of North Carolina at Chapel Hill, School of Dentistry. Upon graduation in 2005 with the degree of Doctor of Dental Surgery, Dr. Scott began his career in the United States Army. While on active duty, Dr. Scott completed a 12-month Advanced General Dentistry Residency at Ft. Lewis, WA. He then served with the 3rd Infantry Division located in Fort Stewart, GA and was deployed to Iraq in support of Operation Iraqi Freedom. After separating from active duty, Dr. Scott returned to eastern NC and settled in Cape Carteret, NC. Dr. Scott has since completed an intensive dental implant continuum and earned Fellowship status in the International Congress of Oral Implantologists. Dr. Scott’s greatest pride is his wife and three children. They are members of the Swansboro United Methodist Church. Occasionally, Dr. Scott slips away for a variety of outdoor pursuits.